Our round of testing brings together an international selection of seven side clip-style panniers for general urban cycling and commuting, ranging in size from 20 liters to 28 liters, and with features ranging from basic to sophisticated. 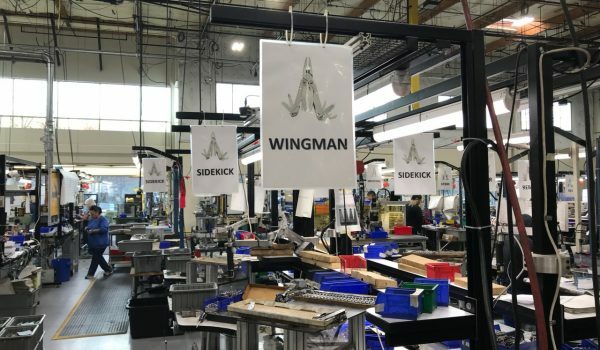 The bags came from manufacturers that our testing team was both familiar with and wanted to learn more about. The German-made Ortlieb Vario QL 2.1 may be the preferred brand of the world-traveling cyclist, but its mettle was tested to see if it was up to the grind of a daily bike commute. Hailing from Canada is the Arkel Signature V. It’s a handcrafted masterpiece, but its beefy cargo capacity and minimalistic design needed to be tested for real commuter practicality. After testing a pile of bike panniers for the distinguished bike commuter from all corners of the globe, the coveted Best in Class award went to the North St. Morrison. 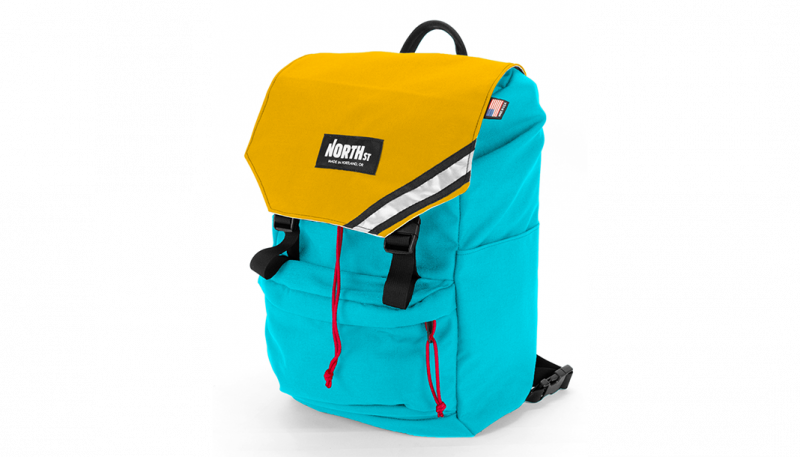 The North St. Morrison pannier is a durable, waterproof pannier that is made in the U.S. It has a fast and simple rack mounting system that securely attaches the pannier to the rack. 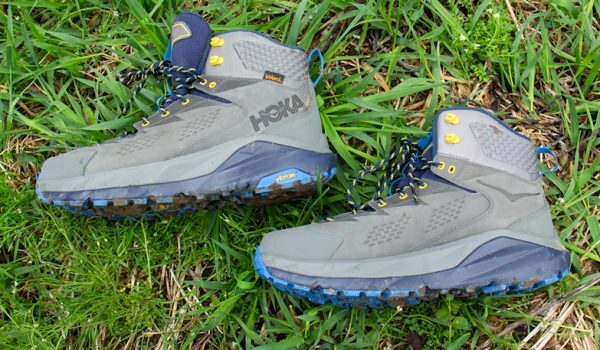 It comes with a stashable backpack harness that is fast and easy to use. However, its exterior zip pocket is not waterproof and the mounting system is not adjustable. 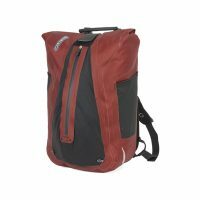 The Ortlieb Vario QL2.1 is a high-quality waterproof pannier that is made in Germany. It has a fast and easy rack mounting system that securely attaches the pannier to the rack. 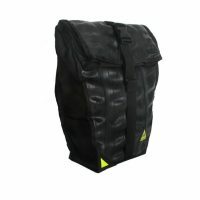 It comes with a detachable backpack harness that fits conveniently into a waterproof outer pocket. However, carrying the pannier backpack-style is not comfortable for longer carrying distances with heavy loads. 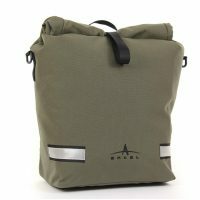 The Arkel Signature V is a high-volume, high-quality pannier that is made in Quebec, Canada and contains its makers signature on an inside label. Its Cam-Lock® mounting system is the best of all the panniers in the test and its TPU- laminated nylon liner with fully-taped seams and roll-top closure makes it waterproof. However, despite its ample cargo capacity, it lacks convenient organization pockets. The Brooks England Suffolk is a high-quality waterproof pannier that is made in Europe. It has a fast and easy rack mounting system that securely attaches the pannier to the rack. It has a retro, classic design that is well-made and attractive. However, its versatility is limited without an attachable shoulder strap. 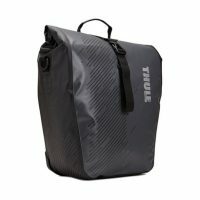 The Thule Pack n’ Pedal Shield Pannier is a waterproof durable pannier with outstanding reflectivity. It comes as a pair providing up to 48 liters of cargo capacity making it the most accommodating for bike commuting and shopping. 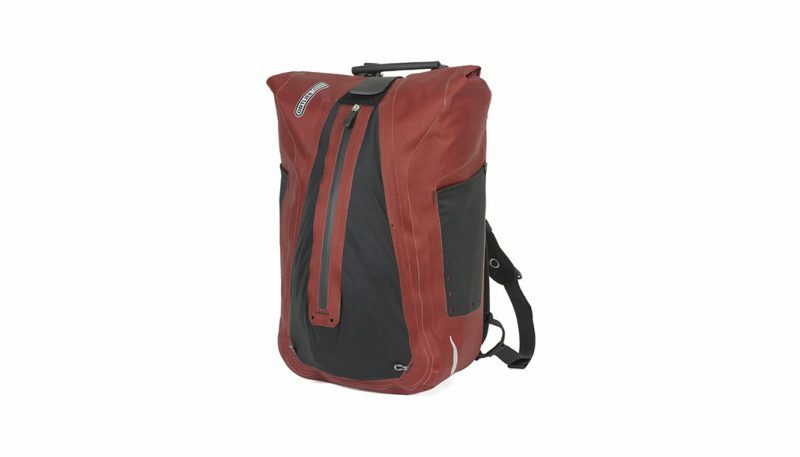 However, the shoulder straps are narrow and thin and the panniers lack internal organization. 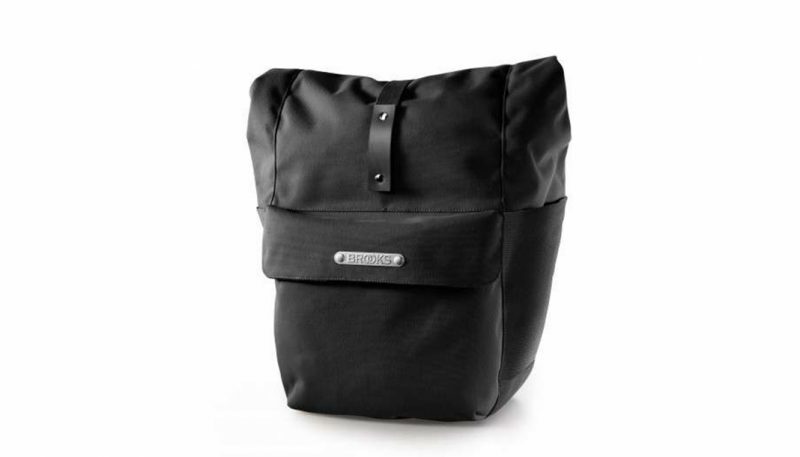 The Timbuk2 Lux pannier is a lightweight and attractive pannier with outstanding organization. Its 22-liter capacity cargo space easily accommodates the bike commuter’s daily needs. However, the shoulder strap and grab-handle are narrow and thin, making heavier loads uncomfortable to carry for longer distances. The ease and speed of attaching and detaching the pannier was a key function of this criterion. There were actually four winners who all scored an eight: The North St. Morrison, Ortlieb Vario QL2.1, Arkel Signature V and the Brooks England Suffolk. The North St. Morrison’s mounting system consists of two simple, non-locking, durable metal hooks that hang from the top of the bike rack and lower metal hook. However, the metal hooks are riveted in place and do not adjust forward and aft making it unable to accommodate all rack styles. The Ortlieb Vario’s QL2.1 and Brooks England mounting systems are identical and offer the fastest attach and remove from the rack. The 16 mm hooks are always in the open positon when carrying the pannier by its grab handle, providing there is some weight in the pannier. The Arkel Signature V Urban pannier’s Cam-Lock mounting system works by lifting the loaded pannier by the Cam-Lock carry handle, which disengages the cams, and setting the pannier Cam-Locks on the bike rack and releasing the handle. The Cam-Locks drop down and engage the bike rack. 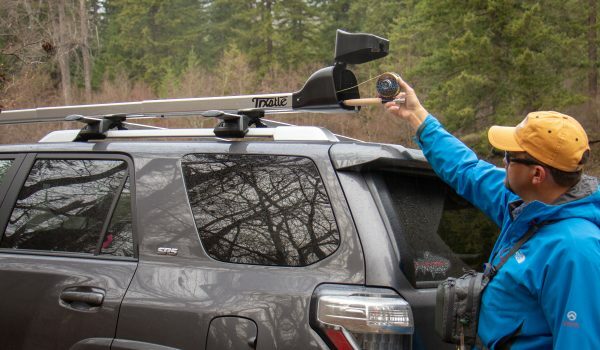 The Thule Pack ‘n Pedal Shield’s rack mounting system uses two spring-loaded cams that attach the pannier to the rack using the weight of the pannier and its contents. When pulling upward, grab the handle to release the hooks to a horizontal position. Once the hooks are aligned with the rack, release and the pannier is locked onto the rack. It sounds easier that it actually was. Our tester found that spring tension in the cams was stiff, making attachment and detachment a two-handed affair that requires a bit of effort, hence the score of six because a couple times the latch got stuck and required fiddling with a bike tool. The Green Guru 36L High Roller Backpack pannier’s Quick Mount mounting system is composed of two, non-locking, durable metal hooks that hang from the top of the bike rack and lower metal hook with an adjustable strap and bungee that attaches to the bottom of the rack. This is the simplest of all the panniers in the test, but it scored five because the metal hooks are riveted in place and not adjustable. The Timbuk2 Lux pannier’s Quick Clip mounting system consists of a set of metal clips that secure the roll top closure on each side. However depending on the rack size and cross-bar placement, the cyclist may need to adjust the position of one of both Quick Clips with a Phillips screwdriver. Our tester did have to adjust it to fit the rack of her Civia Hyland but the factory settings worked fine on the Trek District. Still it scored five because the Velcro loop that attaches the lower part to the bike rack is tricky to use. One of our testers has a fair walk to the office from the bike rack, so this category was evaluated on how fast panniers could be transitioned from pannier to backpack or shoulder bag. The North St. Morrison was the winner with a solid eight points. It comes with stashable shoulder straps that fit conveniently into their own pocket when not in use. Converting from pannier to backpack is the fastest of all the panniers in this test. Our tester only had to remove the straps from their pocket and clip them via a sturdy plastic clip. For even faster transitions, it could be “single-strapped.” Of all the panniers that converted to backpacks, the North St. Morrison was also the most comfortable to carry with a heavier load. 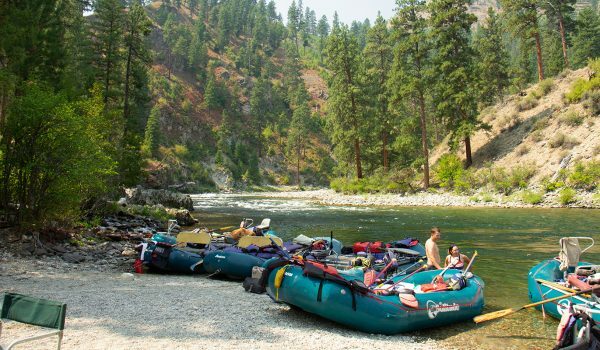 The most uncomfortable were the Green Guru 36L High Roller and the Ortlieb Vario QL2.1, both of which scored a seven for similar reasons: the backpanels felt like they had metal plates welded in place and pressed uncomfortably on some testers’ backs under heavier loads. The Arkel Signature V, Brooks England Suffolk, Thule Pack ‘n Pedal Shield and Timbuk2 Lux are not backpack convertible and shared the same score of five for different reasons. The Arkel Signature V comes with a detachable shoulder strap that is wide enough to ensure a degree of comfort when carrying on the shoulder with a light load. However the shoulder strap lacks any padding and when our tester carried a load of groceries, it was very uncomfortable. The Brooks England Suffolk does not come with a detachable shoulder strap, so the only way to carry is by its padded grab handles. The Thule Pack ‘n Pedal Shield comes with a detachable shoulder strap to carry from bike to office although it lacks the padding needed for comfortably carrying heavier loads. 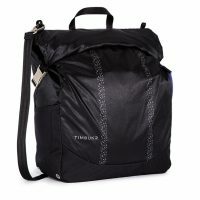 The Timbuk2 Lux pannier also comes with a detachable shoulder strap to carry from bike to office and back, but it’s narrow and lacks a shoulder pad, making it uncomfortable to carry heavier loads for longer distances. Winter commutes in Minneapolis consist of cold temperatures, snow, ice and all the salt thrown down to melt the snow and ice, so this category was evaluated on the pannier’s construction, materials and washability. The Brooks England Suffolk, Green Guru 36L High Roller and Arkel Signature V all scored the highest in this category with eight points. 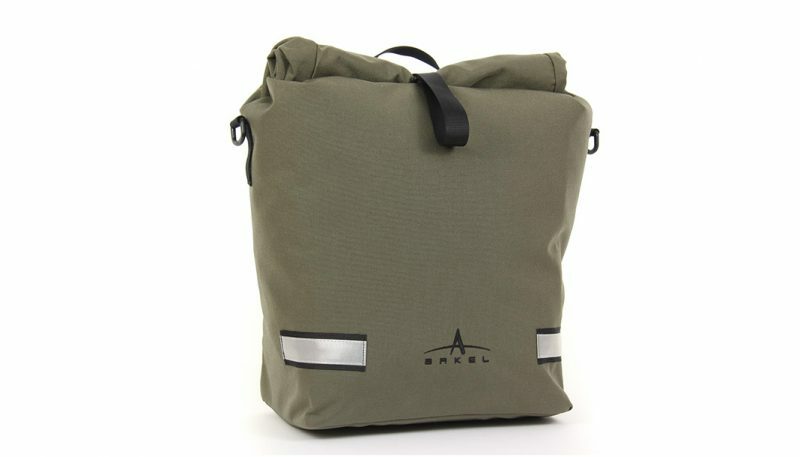 The Arkel Signature V is made with 1,000 denier US-made Cordura nylon. After a few weeks of commuting in slushy conditions, the Arkel Signature V cleaned up with a wet washcloth. Also, the Cam-Lock mounting system is comprised of solid aluminum hooks that are strong, well-made and will remain rust-free over time. 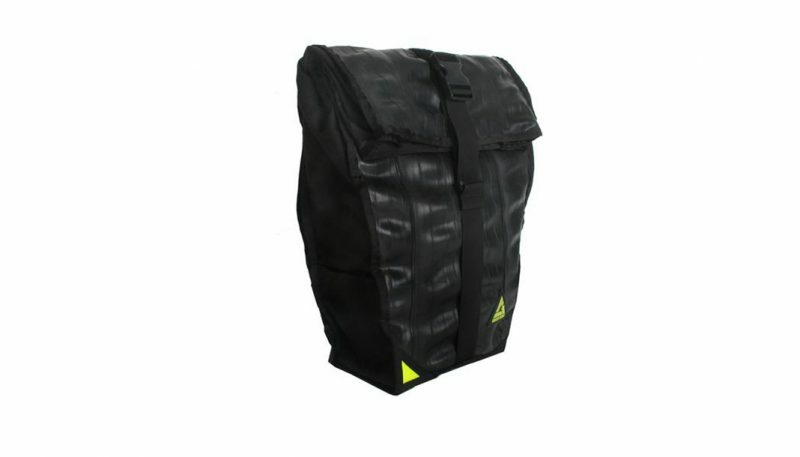 The Green Guru 36L High Roller Backpack pannier is made with recycled bicycle inner tubes and a durable 10 ounce vinyl waterproof tarp material, with black nylon Cordura on the ends and bottom. An HDPE plastic framesheet gives it its structure. Cleaning the pannier is very easy and requires only a damp or wet washcloth. The Green Guru 36L High Roller Backpack pannier mounting system hardware is vinyl-coated metal, and the clips that secure the flap and attach to the bottom hook are a very heavy-duty plastic, all of which should remain rust-free. The Brooks England Suffolk is made with a high-quality polyester Bluesign-certified fabric with waterproof polyurethane coating. Its construction is outstanding and thoughtful. The mounting system is comprised of solid plastic hooks that are strong, well-made, fully-adjustable and secure. The occasional sponge-bath easily removes all the salt crust and mud. Scoring seven points is the trio of the North St. Morrison, Orlieb QL2.1 and Thule Pack ‘n Pedal Shield. 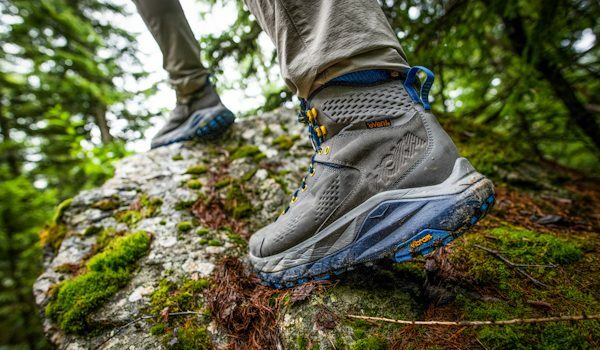 The North St. Morrison is made from military-grade 1,000 Denier waterproof Cordura nylon shell and an X-Pac vX21 waterproof liner. It’s relatively simple to clean with a washcloth, assuming it isn’t mud-caked. If completely filthy, it will require a full submersion in a bathtub or shower. The mounting system hardware is a durable vinyl-coated metal. The bungee that secures the bottom hook is a heavy and wide elastic band and the bottom hook is also vinyl-coated metal. As long as the vinyl coating holds up, the metal should remain rust-free. 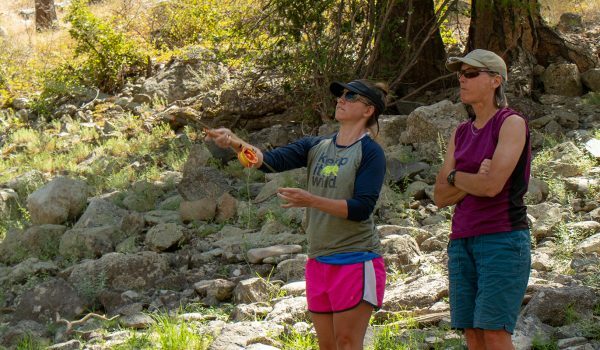 The Ortlieb Vario QL2.1 is made of tear- and abrasion-resistant nylon fabric that is both waterproof and very easy to clean with a washcloth. The mounting system is comprised of solid plastic hooks that are strong, well-made, fully-adjustable and secure. 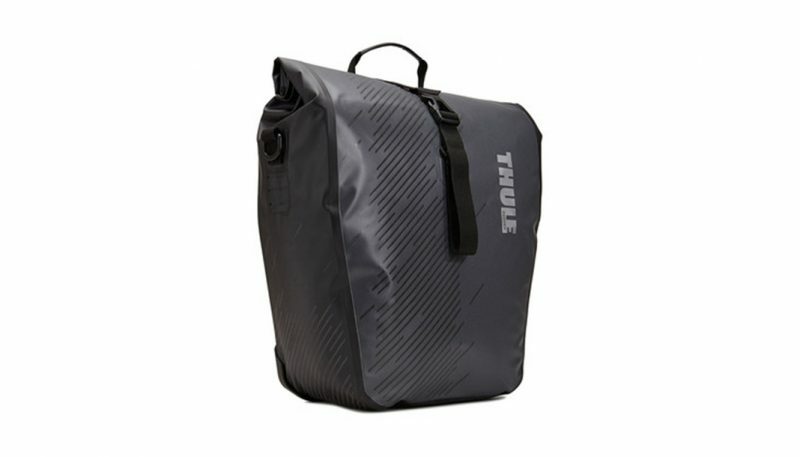 The Thule Pack ‘n Pedal Shield pannier is made with a durable waterproof-coated fabric. Cleaning requires only a damp or wet washcloth. The Thule Pack ‘n Pedal mounting system is made of a heavy and durable plastic. The clip that secures the roll-top flap is made of a heavy plastic. Unfortunately, plastic parts are a bit of a lottery when the temperatures plunge to -20 degrees, so this is something to keep an eye on with the Ortlieb Vario QL2.1 and the Thule Pack ‘n Pedal Shield. 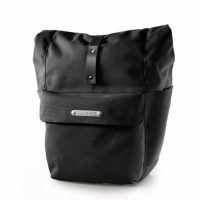 The Timbuk2 Lux pannier, which scored the lowest in the category with six points, is made with a lightweight Nylon ripstop fabric. Cleaning is simple, via a sponge-bath with a wet washcloth and it can even be submerged and hand-washed in a sink. The Timbuk2 Quick Clip mounting system is made of a heavy plastic and the clips that secure the flap are metal. But like the Ortlieb Vario QL2.1 and the Thule Pack ‘n Pedal Shield, plastic can become brittle and break in very cold temperatures. Although all the panniers that were selected for testing had elements that made them waterproof, the Thule Pack’n Pedal Shield was the most impressive and trustworthy in inclement weather and scored the highest in the test at eight points. Made with an IP64-level waterproof and dust resistant fabric, it has fully welded seams and a dry bag style closure that is secured in place with a smart quick-release buckle strap. One of our testers drenched it with a garden hose and the interior remained perfectly dry. The next best scorers in this category were the North St. Morrison, Ortlieb QL2.1 and the Arkel Signature V, who all scored a seven. The North St. Morrison features a draw-string top closure with a waterproof flap. On rainy days when a cyclist is carrying excessive cargo in the pannier, physical exertion is required to ensure the drawstring enclosure is fully secured under the waterproof flap. If not, the waterproof flap will not cover the entire top and the contents will get wet. 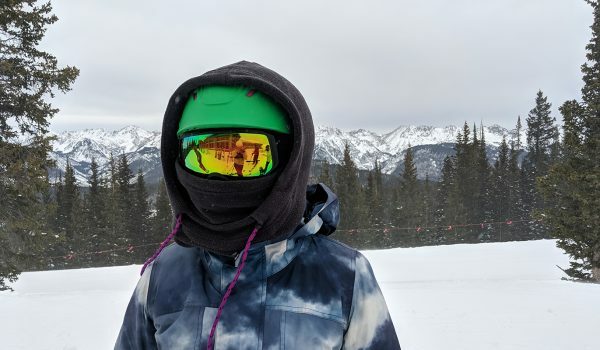 Also, there’s no waterproof lining inside its outer pocket so items that need to be secured or protected from the elements are best carried inside the waterproof main compartment. The Ortlieb Vario QL2.1 and Arkel Signature V are both made with a TPU laminated nylon liner with fully-taped seams and roll-top closure to make it waterproof. Roll-top style panniers will only keep contents dry if the flap can roll at least three times. This won’t happen if it’s overly full of cargo. The Brooks England Suffolk and the Timbuk2 Lux both scored a six. The Brooks England Suffolk is made with a waterproof synthetic fabric on the outside and a TPU-laminated nylon liner with fully-taped seams on the inside. The roll-top closure makes the main inside compartment waterproof. 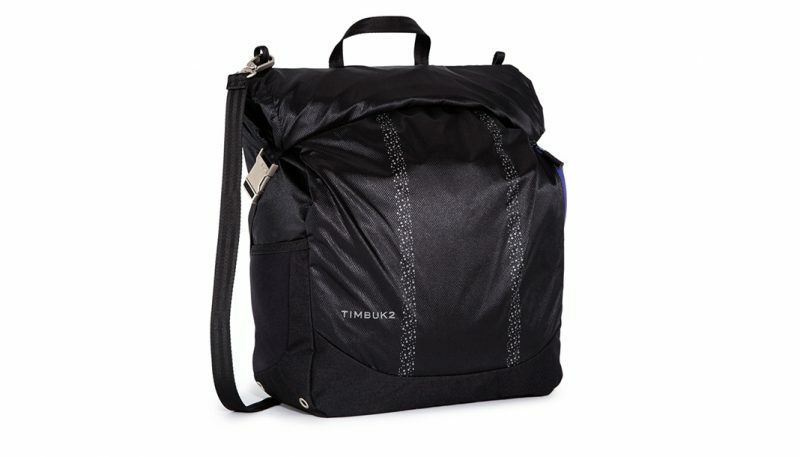 The Timbuk2 Lux has an internal drop liner, roll-top closure and adjustable compression straps to make it waterproof. 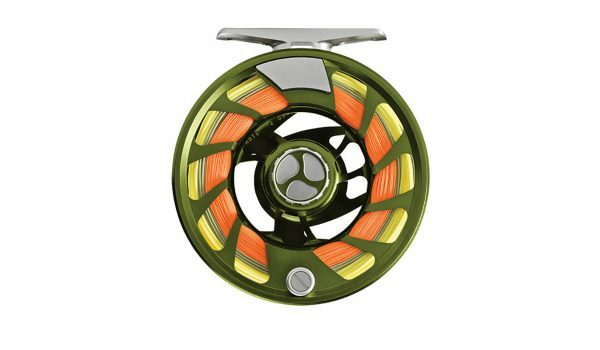 Rounding out the category at five points was the Green Guru 36L High Roller. 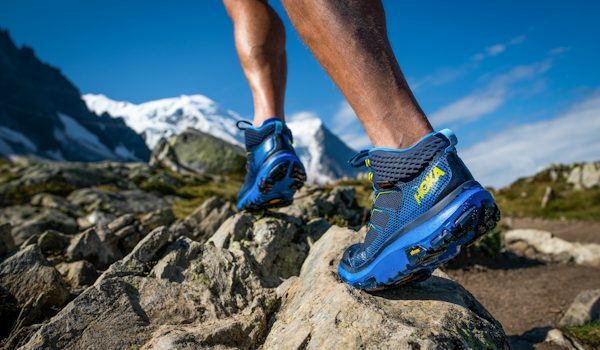 It has a TPU-laminated nylon liner and a weather-resistant envelope-top closure that is secured in place with a strip of heavy Velcro making it waterproof. The thing to be aware of with the Green Guru is that its waterproofness is dependent on accurately lining up the Velcro strip. If it’s off by even a millimeter, the cyclist will likely experience some wetness. The North St. Morrison and the Timbuk2 Lux were the winners in this category with seven points each. Organizational features of the North St. Morrison include one large main compartment, two unsecured outer pockets for carrying items like a bike lock, pump, tools, water bottle or commuter coffee mug. These two pockets are deep making it very difficult for items to pop out. A zippered outside pocket carries items that require easy accessibility, like a wallet, keys or phone. A padded internal sleeve can hold up to a full-sized iPad but squeezing in a 15-inch IBM ThinkPad was a chore. Other nice features are reflective elements and Velcro mounts inside the pannier that hold additional organization pockets (not included). 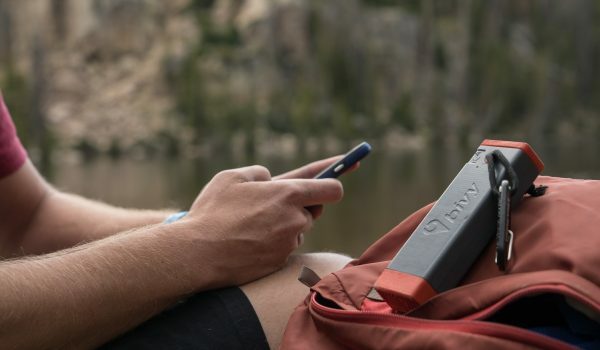 The Timbuk2 Lux has a detachable shoulder strap, convenient organizer pocket inside the main compartment that holds small items like keys, phone, wallet and pens and a padded laptop sleeve. Like the North St. Morrison, a 15-inch laptop fits but it’s a tight squeeze. The roll-top design closure system closes with two magnets and a set of sturdy metal clips and nylon webbing. On the outside of the Timbuk2 Lux is a large secured zippered pocket with taped seams that is ideal for carrying tools or items that need to be accessed quickly. A set of neoprene stretch pockets hold items like a bike lock or water bottles. Reflective elements include the Timbuk2 logo and two stripes down the front of the pannier. The Ortlieb Vario QL2.1 scored the next highest with six points. Inside is a large main compartment with a small zippered mesh pocket for carrying items that need to be secure. It does have a sleeve to hold up to a 15-inch laptop, but it isn’t padded. Outside are two neoprene outer pockets for carrying a bike lock, pump, tools, phone or water bottle; but they’re narrow at the bottom and wider at the top, making the pockets not as secure. Case in point, one tester rode over a sizeable bump in the bike path and her bike lock popped out. 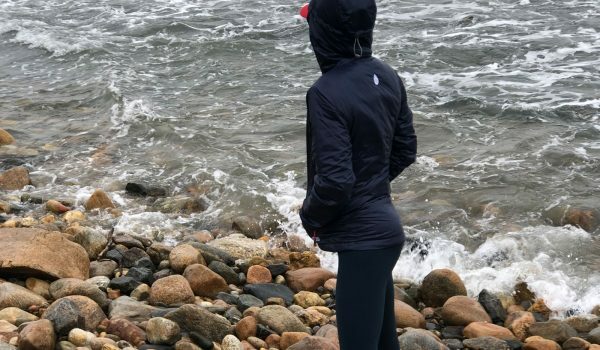 An outer zippered pocket stashes the backpack harness, but our tester found that leaving the backpack harness at home allows the zippered pocket to carry raingear or other items. A detachable bungee system on the pannier’s exterior can hold a helmet, though our tester found it too fiddly to use. Reflective elements, a vital safety feature, are limited to a single three-inch strip. Sharing a score of five each are the Brooks England Suffolk, Thule Pack ‘n Pedal Shield, Green Guru 36L High Roller and the Arkel Signature V. Of these four, only the Brooks England Suffolk features any semblance of organizational opportunities. It has two external stretch mesh pockets on each end that can carry a water bottle or bike lock. Inside it can carry a laptop, but lacks a laptop sleeve. It doesn’t have any reflective elements. Conversely, the Thule Pack ‘n Pedal has a highly-reflective pattern on the front and side of the pannier. Inside the pannier is a small, unsecured mesh organizer for small items like keys, phone or wallet, but no laptop sleeve. The Green Guru 36L High Roller also lacks a dedicated laptop sleeve. 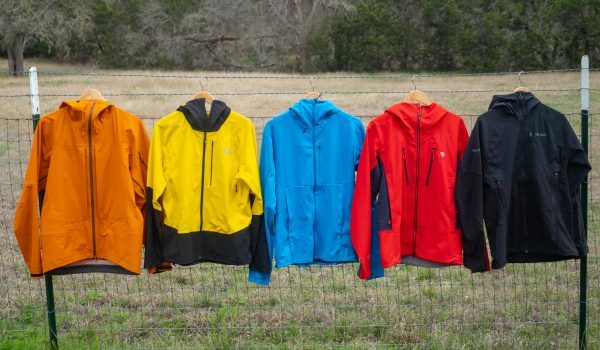 A set of outer side pockets can hold items like a bike lock and a pump, but the pockets are neither stretchy nor deep, which compromises security. As with the Ortlieb Vario QL2.1, a tester’s bike lock popped out of the pocket when she rode over a rough section of trail. Reflective elements include a highly-reflective simple triangle on the front and reflective stripes on the blinkie light webbing loops on both ends of the pannier. The Arkel Signature V also has decent reflective elements (though not nearly as prolific as the Thule) in the form of two wide strips on the front of the pannier. But unlike the Thule Pack ‘n Pedal Shield and the Green Guru 36L High Roller, it does offer a padded laptop sleeve inside its ample bosom, as well as a small zippered pocket for carrying keys, phone or wallet. Reviewing seven panniers was a lesson in contrasts and patience. Where one pannier had outstanding cargo capacity, it may have lacked organizational features. Another pannier had the looks and charm, but not necessarily the heft. Some panniers were made with better materials, and their price points account for that. Some are designed for the minimalist cyclist; others are geared towards the gearheads. Ultimately, the North St. Morrison earned Best in Class. Its bright color scheme allows it be seen by cars. Its durable construction means many years of reliability. It was the pannier that our testers kept going back to for comparison after completing a test cycle with each pannier. 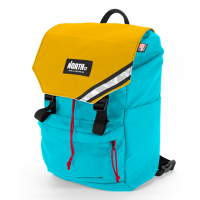 The Ortlieb Vario QL2.1 and the Green Guru 36L High Roller worked as backpacks – but the North St. Morrison worked better: Transitions from pannier to pack were faster and heavier loads more comfortable to carry. The cargo capacity of the Arkel Signature V and the Thule Pack ‘n Pedal Shield pair was outstanding – but filling up the North St. Morrison meant not pedaling 40 pounds of groceries up a hill. The Brooks England Suffolk and the Timbuk2 Lux are classy and stylish – but the North St. Morrison is more so, and it has greater versatility. Our testing team is headquartered in Minneapolis, MN, and tested each pannier for more than 100 miles of commuting and general errand-running in varying temperatures and weather conditions. Each pannier was evaluated on five categories: Comfort/fit, stability, storage, durability and extras. The panniers in this test were used for three weeks as daily commuter panniers and for grocery, farmer’s market, and other general urban errand rides on distances that ranged from six miles to 15 on a Civia Hyland and a Trek District. Each pannier’s waterproofness was tested extensively in rainstorms. When a rainstorm was not available, a rainstorm was simulated with a garden hose.